I have written about Le Périgord several times over the past four decades and I find that I could pretty much reprint what I said four years ago or ten years ago about this great bastion of French cuisine in NYC, whose competitors once numbered a score of such places with names like Lutèce, La Caravelle, Le Cygne and Le Pavillon, all long gone. I have written about Le Périgord several times over the past four decades -- it opened 52 years ago -- and I find that I could pretty much reprint what I said four years ago or ten years ago about this great bastion of French cuisine in NYC, whose competitors once numbered a score of such places with names like Lutèce, La Caravelle, Le Cygne and Le Pavillon, all long gone. Only the venerable La Grenouille survives and thrives along with Le Périgord, leading to the conclusion that such restaurants are wholly out of fashion. The truth is, those other restaurants--what used to be called the "Le and La crowd"--closed for various reasons that range from impossible real estate hikes (when Le Périgord opened in 1964 its rent was $600 a month) to the retirement or death of the owners. There is no question that more modern styles of French restaurants opened in their wake--Daniel, Jean-Georges, Le Bernardin--and NYC is still rife with French bistros like Benoit, Cognac Brasserie and La Mangeoire, but Le Périgord sails on against prevailing fashion, and it is as certain that you will meet owner Georges Briguet today as you would have in 1970, 1980, 1990 or 2000. The word redoubtable seems created to describe Monsieur Briguet, as affable a Swiss host as you'll ever find, ever in a tuxedo and pleated shirt (as are the captains), smiling broadly and greeting old and new friends, and always trying to find a way to make you come back again and again. Joined by his son, Christopher, Monsieur Briguet now works at his beloved restaurant simply because he loves it more than anything in the world, and he gets antsy when he takes vacations or even days off. Madame Briguet must be a very understanding woman. The premises differ considerably from the dated look of old-line French restaurants with their scarlet banquettes and crowded-in tables in a favored front room; instead the dining room is done in warm tones of gold with track lights and mirrored columns, with well-separated tables set with roses, and the lighting flatters everyone from the front of the restaurant to the rear and along every wall. 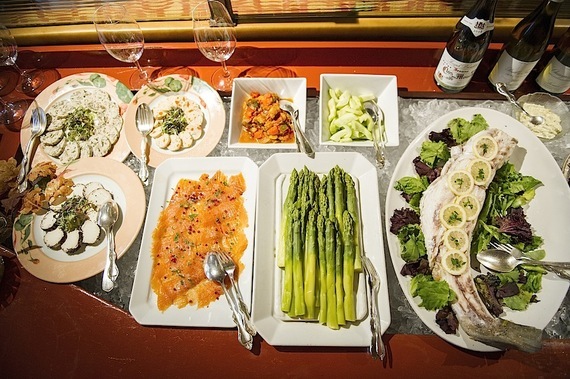 There is a marvelous array of cold hors d'oeuvres (below) as you enter--from smoked salmon and poached asparagus to pâtés, terrines, and cold shellfish with mayonnaise ($22)--next to an equally tempting cart of desserts and a guéridon for carved roasts. Le Périgord still maintains a clientele from Sutton Place and the nearby U.N., and on a recent visit a number of representatives from Singapore dined happily at a long table in the main dining room, while a group from Goldman Sachs was in the rear party room. You sit down to find the tablecloth thick, the pats of butter abundant, the bread made in house, the wine list full of old vintages whose prices haven't changed in years, especially the collection of Burgundies. Longtime Chef Joel Benjamin has honed every dish on the menu to rigid classic standards, so recommending the Dover sole (below) à la meunière ($50), or the quenelles of pike in sauce Nantua, is always a sure bet. Monsieur Briguet insists with total justification that Benjamin makes the best lobster bisque ($12) in the city--not too thick with cream, carefully passed through a sieve, tasting of nothing but lobster and the faint smokiness of its roasted shell. The foie gras, from D'Artagnan, has a perfect little rind of yellow fat around it and glistening cubes of Sauternes gelée ($22). Meaty but tender sweetbreads are dusted with Moroccan harissa and sweet Bell pepper ($18), while escargots are served out of their shell, as a fricassee with hazelnut butter and wild mushrooms ($18). As many times as you'll have rack of lamb in NYC, you'll rarely find it so perfectly cooked, so perfectly fatted, and so generously portioned with a fresh thyme crust as you will here ($46). When was the last time you had roast duck ($40), its skin as crisp as parchment, carved in front of you, pieces then placed on a warmed plate and drizzled with an impeccably reduced jus fragrant and sweetened with orange? This dish seems to be making a comeback in some quarters of NYC, but Le Périgord's version is still far out ahead. You must order soufflés ($8) in advance and, whether chocolate, hazelnut, Grand Marnier, or other, they will also exhibit how practice makes perfect in the way they achieve the ideal rise above the rim, the careful melding of egg whites and flavorings, and the pour of sauce or ice cream in the steaming pierced top. 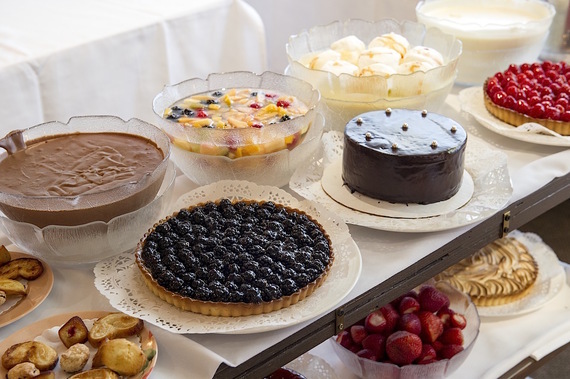 Otherwise you must choose among desserts that seem to beam at you from their cart--deep dark chocolate mousse, golden Tarte Tatin, and my favorite, oeufs à la neige of whipped, cloud-like egg white puffs bathed in crème anglaise. Ten dollars brings you a selection of several desserts offered. A prix fixe lunch is just $35 (also à la carte), and dinner, at $75 (with à la carte options, too), runs far below La Grenouille's $138. One more touch that makes Le Périgord unusual: It's open on Sundays for dinner, when many families will assemble for a fine, restful meal and gracious hospitality. Monsieur Briguet always seems to hint that someone might buy Le Périgord, but it's difficult to imagine he would ever give up his labor of love and more difficult still to imagine Le Périgord without him. Le Périgord is open Mon.-Fri. for lunch and nightly for dinner.